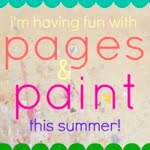 Reading with children, creating with children - this is my joyride. Flat is sleek and sophisticated. Flat is the latest in technology. Flat is the stomach you have after months of gym work. Flat is the satisfying snap of cardboard once the boxes have been collapsed. Flat is Stanley, Flat Stanley. Flat Stanley wasn’t always flat, oh no. He was a regular kid, until his bulletin board fell on him during the night and squashed him flat. Just like that. Flat as a pancake. When Stanley Lampbchop is flat, his younger brother can fly him as a kite. His parents can post him in the mail from their home in New York to a friend’s house in California. He even helps the police to solve a crime. Arthur has a brilliant idea, and uses an old bicycle pump to pump Stanley full of air. It works! Mr and Mrs Lambchop were both very much in favour of politeness and careful speech. “Hay is for horses, Arthur, not people,” Mr Lambchop said. The slight sibling rivalry between Stanley and Arthur is not out of place today. Of course you would be jealous of a flat brother who had marvelous adventures, wouldn’t you? Thanks to Grandma for the large Stanley who now resides with us. Apparently he looks after Annalise's dolls when she's not here! Thanks to my youngest brother whose old copy of “Flat Stanley’s Fantastic Adventures” by Jeff Brown we are now reading. This includes the first story, “Flat Stanley”, as well as “Stanley and the Magic Lamp” and “Stanley in Space”. You can also buy “Flat Stanley” as a picture book. I spend my days reading to my three children, writing and illustrating, cooking for my family and friends, sewing, and occasionally working as a freelance editor.